Phil Maroney, left, the Daytona Regional Chamber of Commerce's outgoing chairman, stands next to Nancy Keefer, the chamber's new president and CEO, and attorney Jim Rose, who was installed Monday as the chamber's 2014 chairman during its 94th annual meeting at the Hilton. The following was excerpted from the February 12th NewsJournal article entitled "Membership On The Upswing". Maroney, in his outgoing remarks before turning over the ceremonial gavel to the chamber’s incoming 2014 chairman James Rose, credited George Mirabal, the longtime former chamber president who came out of retirement in March to fill in as interim president following the resignation of Larry McKinney, for bringing much-needed stability to the chamber and its staff. He also praised the chamber’s new president and CEO, Nancy Keefer, who was hired in October following a national candidate search, for infusing the group with a sense of renewed enthusiasm and energy. 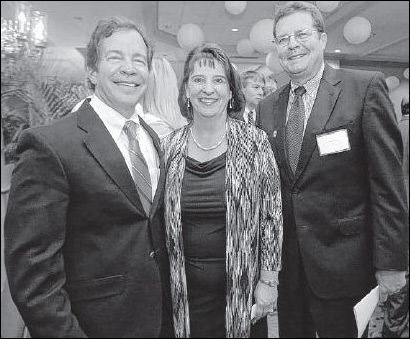 “2013 was a year of action” for the chamber, Maroney told the audience, adding that the organization in the past year also greatly improved its financial con­dition. Rose praised Maroney, president of the Root Co. in Ormond Beach, for being instrumental in helping steer the chamber “through some troubled times” last year. “He was the right guy at the right time,” Rose said of Maroney’s stint as chamber chairman. “There’s a renewed enthusiasm for the chamber.” and the planned beachside Hard Rock Hotel and nearby Protogroup hotel/ condominium project. Click here for the complete NewsJournal article.